Ok, I'm picking up from where I left off on Day One (see previous post). After leaving the luxurious LaQuinta in Jackson, TN we headed toward South Central Tennessee just east of the Tennessee River (Linden, Centerville, Decaturville, and Charlotte). My only objective for the day (besides work) was to find and snap a photo of the Minnie Pearl statue in downtown Centerville. Driving through through this part of Tennessee, we soon realized the area is largely agricultural and still very rural. The small towns that dotted the countryside largely consisted of a couple of houses and maybe a gas station at best. And much to our surprise- A Dollar General. Let me just say that Dollar Generals were located in almost every single town we reached. We even created a game to see who could spot the first Dollar General in each town. Just now I checked out their website and they currently operate over 8,200 stores and are based in Goodlettsville, TN. They specifically target communities that aren't large enough for a Wal-Mart. I guess that explains why so saw so many along the way. Around mid-morning we reached Centerville and I was able to find the statue of Minnie Pearl directly across the street from the County courthouse. The statue was erected after the town recieved an anonymous donation of $150,000 in honor of the late Sarah Cannon (a.k.a. Minnie Pearl) Many people think that Minnie Pearl is from "Grinder's Switch". Although there is an actual railroad switch named after the Grinder family, there is no such town by the same namesake. It is a fictional town located just outside of Centerville. After we finish driving the rest of our routes, we decide to have a late lunch at the famous Loveless Cafe on the way back to Nashville. The Loveless Cafe and Motel is located along Highway 100 near the northern terminus of the Natchez Trace Parkway. Loveless Cafe began serving their southern style dinners in 1951 out of the early 1900s house owned by the Loveless family. 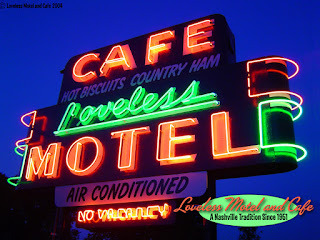 Famous for their fried chicken and biscuits, the Loveless Cafe is frequented by celebrities and locals alike. The adjoining motel ceased operations in 1985 and the rooms were converted to small shops. The Loveless gift shop is a must-see as it is full of kitschy souvenirs: Dr. Burton purchased Loveless band-aids that look like bacon strips. With my belly full of fried chicken, mac n' cheese, creamed corn, and biscuits, we called it a day knowing we would be back on the road bright and early to drive out to the Upper Cumberland region for Day Three. Day Three of our trip found us driving around the Upper Cumberland region. Specifically, we visited Carthage, Smithville, Gainesboro, and Byrdstown. I lived in this region during college when I attended Tennessee Tech in Cookeville, so I'm very familiar with how beautiful the landscape is as you reach the Highland Rim. We saw lots of rolling hills and scenic farms and took a beautiful scenic route (SR-52/SR-53) from Gainesboro to Livingston that took us by the entrance to Standing Stone State Park. Unfortunately we had a job to do, so no stopping at the park! We decided to have lunch at the The Apple Dish restaurant/antique store on the historic Livingston town square. Here you can order a hamburger and peruse various antiques all in the same spot. They have some really cool antique jewelry here and I coveted several pieces, but seeing as how I have a wedding coming up in the near future, I need to save my money. I didn't really take any photos that day because the weather was so overcast, but I did take the following photo of a souped-up Rascal scooter at a gas station in Livingston. I was impressed at the time this older man took to "pimp his ride". Check out the awning and cooler. Well, I'll continue with Days Four and Five in the next few days or so. Hope you're enjoying!